The 2nd Dragoons (Royal Scots Greys) was stationed at York when Britain declared war on Germany on 4 August 1914. The Regiment landed at Havre, France on 17 August as part of the 5th Cavalry Brigade which was placed under Gough’s Command on 6 September. On 13 September 1914, Gough’s command became the 2nd Cavalry Division and the Regiment served in this formation for the remainder of the war. The 2nd Dragoons was involved in skirmishes with German forces within a week of landing in France and helped to cover the Retreat from Mons. The Royal Scots Greys saw extensive action during the opening months of the war and fought in a dismounted role at the First Battle of Ypres. With the development of trench warfare, the Regiment had long periods billeted behind the lines, though it did suffer heavy casualties during the Second Battle of Ypres in May 1915. The next major engagement for the Regiment was the First Battle of the Scarpe in April 1917, part of the Battle of Arras. The Scots Greys was engaged later in the year during the Battle of Cambrai in November and December 1917. In 1918 the 2nd Dragoons was caught up in the German Spring Offensive which opened in March 1918. After Armistice, the Regiment moved to Germany before returning to England in March 1919. Twenty soldiers of the Royal Scots Greys are commemorated on the Poziers Memorial to the missing with their deaths occurring between 23 March and 1 April 1918. The Pozieres Memorial commemorates over 14,000 British and South African soldiers who died on the Somme between 21 March and 7 August and have no known grave. One of the two panels commemorating soldiers of the Regiment on the memorial is shown below. 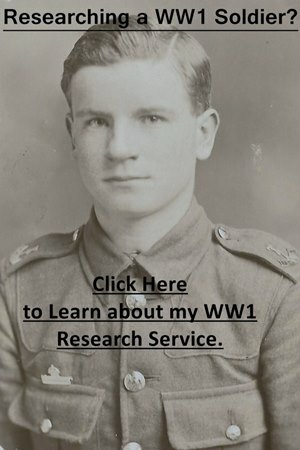 Start by having a look at my generic Guides to Researching WW1 Soldiers, especially those relating to finding service and medal records. For information regarding the 2nd Dragoons’ activities, I’d recommend combining History of The Royal Scots Greys (The Second Dragoons), August 1914 – March 1919 with the Regiment’s war diary. I’ve discussed both below. Officers: First, search to see if a service record is held for the officer at the National Archives: How to Find an Officer’s WW1 Service Record. I offer a copying service for these records. If an officer served past April 1922 then their service record will still be with the Ministry of Defence. I have a guide on how to order these records on my Second World War website: Ordering a Service Record from the MOD. Officers are frequently mentioned in the war diary and regimental history. The regimental history also contains a record of all the officers who served in the Scots Greys between 1914-1931 noting promotions, medal entitlement, honours etc. Other Ranks: A lot of the service records to other ranks were destroyed during the Blitz, so there may not be a surviving record. If a soldier served past January 1920, then their record should still be held by the Ministry of Defence and I’ve written an article to help you here: Ordering a Service Record from the MOD. A handful of other ranks appear in the regimental history, though without regimental numbers. The regimental history also contains a list of honours and awards to other ranks but once again there are no regimental numbers. Medal records are always a good place to start if there is no service record available: Medal Index Cards. If you’re researching a soldier who served in the First World War you’ll need to search the records on both FindmyPast and Ancestry as they have different record sets. Both sites offer a free trial and clicking on the banner below will take you to FindmyPast. If you’re in Britain, your local library may have free access to both sites. There is only one war diary for the 2nd Dragoons which has been digitized by the National Archives. To download this war diary for a small fee click on the blue link below. I have transcribed some entries from April 1917 below. Notes: A good war diary which contains a wide variety of appendices. There is a nominal roll of the cadre of the 2nd Dragoons (Royal Scots Greys) which appears as an appendix after March 1919. There is a regimental history: History of The Royal Scots Greys (The Second Dragoons), August 1914 – March 1919. Compiled by Major the Hon. Ralph Pomeroy. This book was published in 1932 but hasn’t been reprinted so can be hard to find. 92 letters written by Brigadier-General Walter Long who commanded C Squadron, Scots Greys in 1914-15. Long’s letters make interesting reading but he doesn’t have the clearest handwriting! Private Papers of Brigadier-General W Long CMG DSO: Documents.14163. Memoir of Lieutenant J. T. MacNab who served with the Regiment and Bedfordshire Yeomanry during the war. Private Papers of Lieutenant J. T. MacNab MC: Documents.13884. Photocopied memoir of A. W. Bradbury who served in the Hertfordshire Yeomanry and 2nd Dragoons from late 1917 and into 1918. Private Papers of A. W. Bradbury: Documents.7356. 1-4 April 1917: The Regiment remained in winter billets. On the 4th instant, orders were received that the regiment would move to the Eastern Concentration Area of the Division on the 5th instant. 5 April 1917: The regiment left their winter billets at 9.15 am and marched to Crequy. Two Squadrons and Regimental Headquarters at Crequy, one Squadron at Sains-Les-Fressin. 6 April 1917: The regiment remained in billets. 7 April 1917: The concentration of the Division having been completed, the 1st Cavalry Brigade marched Eastwards, the regiment marching via St Pol to Ostreville. The regiment billeted in Ostreville. Lieutenant-Colonel A. Lawson CMG rejoined the regiment in the field from England. 8 April 1917: The Brigade continued its march Eastwards to an open bivouac at Agineres. The regiment bivouacked in a field. Very heavy rain fell during the night. 9 April 1917: The regiment remained in bivouac at Agnieres. Very cold weather, high wind and snow. At 6 pm the Brigade received orders to stand to at one hour’s notice. 10 April 1917: The Brigade moved Eastwards shortly after 12 noon. The regiment followed the 5th Dragoon Guards who were leading regiment. The Brigade moved quickly via St. Eloi, thence round Arras via St Catherine and St Nicholas, thence along road via St Laurent-Blangy to Athies. The roads were in a very bad condition, and the road along the North bank of the Scarpe very congested with traffic. The leading regiment, 5th Dragoon Guards moved into Fampoux, remaining in the village until dark. The regiment moved up in support, halting about 1/4 mile West of Fampoux. No opportunity to advance having occurred, the Brigade withdrew at dusk. The Regiment bivouacked just North West of Athies. The weather was bitterly cold, snow falling during the night. 11 April 1917: It was decided that there would be an infantry attack at midday. The Brigade moved forward at 12 noon from their bivouac at Athies. The Regiment was leading regiment of Brigade. Order of March “C” Squadron (Captain Kingstone MC) “A” Squadron (Lieutenant Barnard) “B” Squadron (Captain Single MC). One troop of the 1st Machine Gun Squadron under Lieutenant Gray was attached to the regiment and marched between “A” & “B” Squadrons. The regiment moved along the Athies-Fampoux road, their objective being to take advantage of the successful attack of the 4th Infantry Division on a line Greenland Hill-Plouvain; then to push through it and act to the North, sending reconnoitring detachments to Vitry en Artois-Fresnes-Gavrelle. The enemy put down a heavy barrage on the Athies-Fampoux road, this barrage was especially heavy at the crossroads in Fampoux. “C” Squadron moved into Fampoux with an interval of 100 yards between troops. The Squadron Leaders pushing on came under immediate machine gun fire on leaving the Eastern outskirts of the village. Regimental Headquarters hearing that the advance of “C” Squadron was held up went forward into Fampoux, the remaining two Squadrons being halted along the Athies-Fampoux road. The situation towards the Inn, 1 mile North East of Fampoux being obscure, an officers patrol was sent towards the Inn, this patrol under 2/Lieutenant Quested when 300 yards to the East of Fampoux came under heavy machine gun fire, all the horses of this patrol were killed, but the officer and men escaped into our trenched under cover of a snowstorm at dusk. “C” Squadron in the village was heavily shelled throughout the operations. At 4.30 pm a message was received that the Infantry would make another attack; this attack did not take place, and “A” Squadron which had been brought up to relieve “C” Squadron in Fampoux was withdrawn at 5.50 pm. The Brigade then returned to their bivouacs at Athies. It was bitterly cold weather, snow and sleet falling throughout the night. Casualties: Lieut. J. B. Grant, 2/Lieut. F. G. Quested, 2/Lieut. G. H. D. Ascoli and 2/Lieut. W. R. Beddington wounded. 4 Other Ranks killed, 18 wounded. Horses: 10 killed, 6 wounded and 3 died of exposure. 12 April 1917: 4 horses of “C” Squadron were killed by a shell at 7 am. The regiment left its bivouac at 9 am and moved westwards with the Brigade to bivouac at Agnieres.